Here’s our thread to discuss all things Hamilton. I’ll be posting new models as they arrive as well as featuring exciting pieces. If you have any questions or comments regarding Hamilton, please feel free to post! Please email me at justin@gembycarati.com or PM me with any questions or price quotes. I will be offering CP pricing! 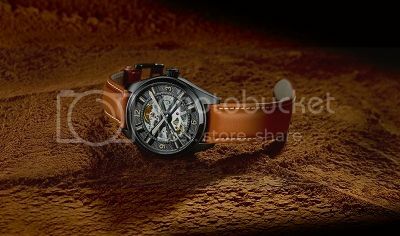 Our first featured Hamilton is the newly released Khaki Skeleton. Using the H-20-S movement that was developed for the Jazzmaster Skeleton last year, this new model draws from Hamilton's aviation heritage to create a striking layered design. It starts with 'H' pattern on the visible movement, to the honey-comb style engraving, to the X-shaped propeller that crosses the dial, to the beige lume on the hands and finishes with the logo that appears to float in the sapphire crystal. Shown here with a 42mm black PVD case, on a chestnut brown leather strap, the new Khaki Skeleton is an absolutely stunning watch. 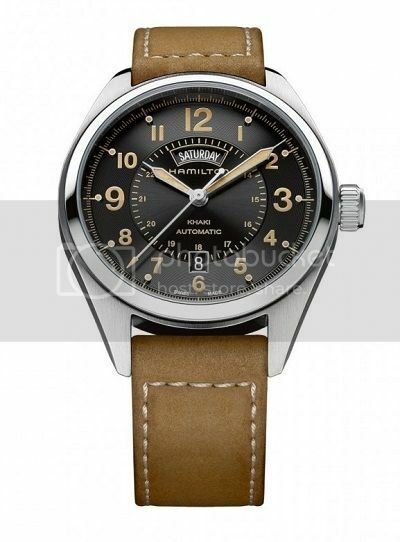 Our next featured Hamilton is the Khaki Field Day Date Auto. As an extension to the popular Khaki Field line, the Day Date Auto features the exclusive H-30 caliber movement which has a power reserve of 80 hours. Shown with the olive coloured green leather strap and matching indicators, this model has a great vintage flair. With its 42mm case size, this watch looks great on almost any wrist. 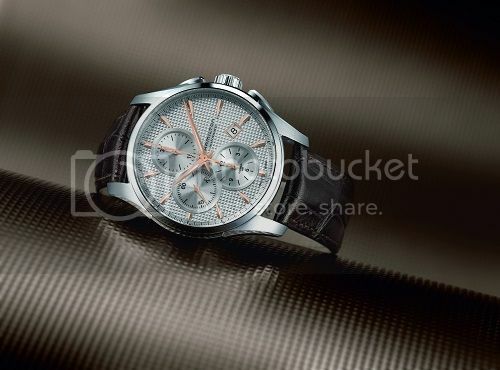 For 2015, Hamilton has released a limited edition of its brilliantly designed Jazzmaster GMT line. The 42mm case is a combination of high polished and brushed black PVD. The dial is a mixture of contrasting grey and bright red elements for easy legibility of its 24 time zones. Limited to only 999 pieces worldwide, the Hamilton Jazzmaster GMT full black will be a very rare timepiece. We’ve finally received our first Hamilton Ventura Elvis80 watches! This long awaited model is an update on the classic Ventura line which dates back to the 1950’s. The Elvis80 features the signature triangular shape with a sleek curved sapphire crystal. The watch measures in at over 44mm at its widest, but on the wrist with the curved and sloped case, it wears more like a 41-42mm watch. 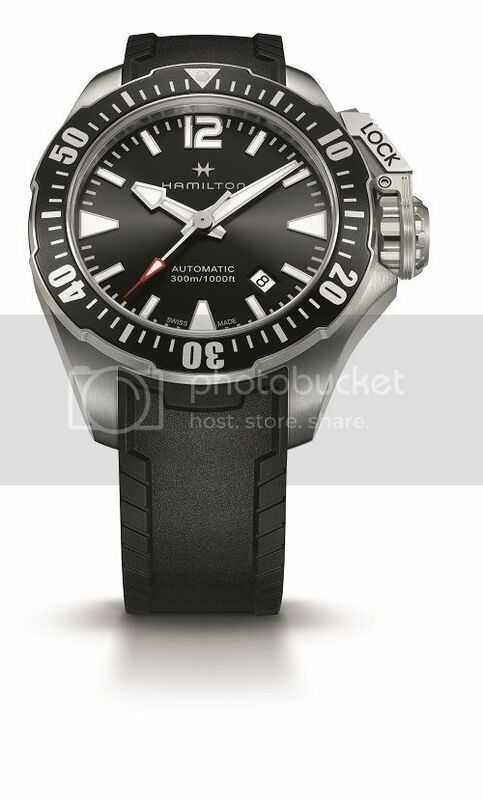 Hamilton has released the Ventura Elvis80 in both automatic and quartz versions. The automatic versions are available with a black PVD case with either a leather or rubber strap and features the H-10 movement with an 80 hour power reserve. 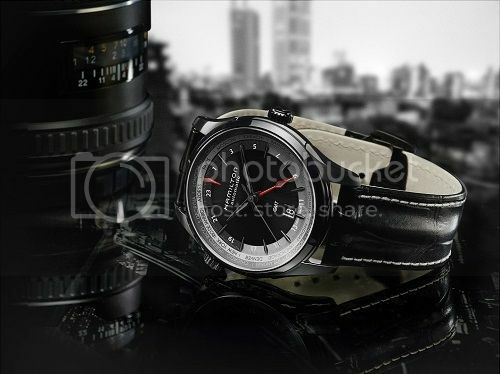 The quartz version is available with a stainless steel case, with stainless steel, rubber or leather strap options. I just bought one in Vegas this weekend. Love them. Will have to check out the availability in Calgary. Congrats, Hamilton is a fantastic line! Which one did you pick up? 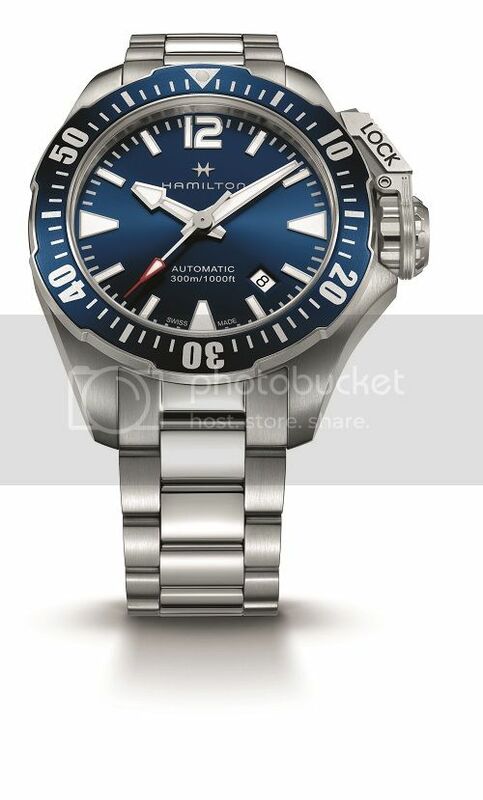 Sorry for the lack of updates, there have been plenty of new releases this year and one of my favourites is the Hamilton Khaki Navy Frogman. Originally created for the US navy in the 1940’s, the Frogman is a purpose built dive watch. 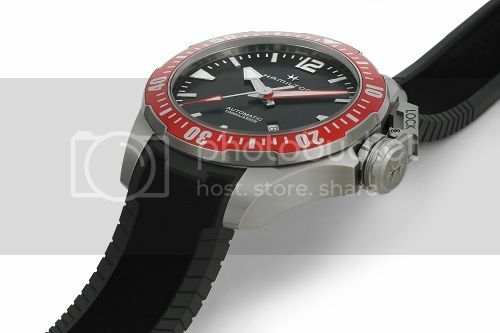 The 46mm version features a titanium case, red unidirectional bezel, a helium valve and 1000 meters of water resistance. 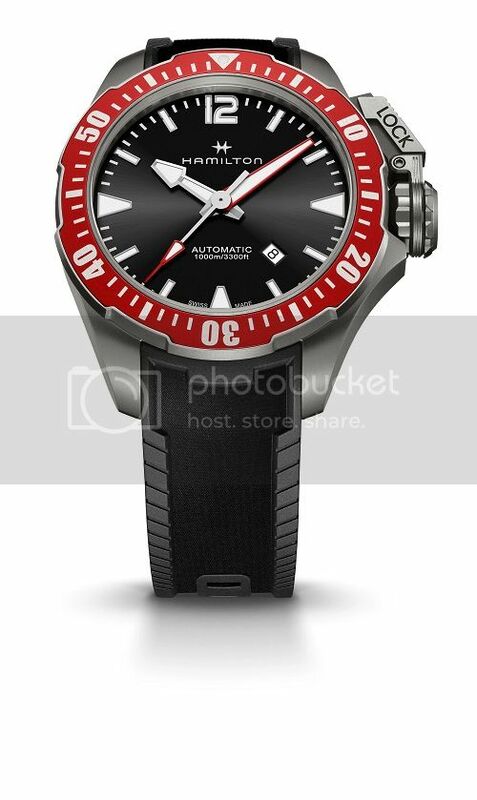 The Frogman is also available in a 42mm version in steel, capable of 300 meters of water resistance. Available with a blue or black dial and bezel combo on either a rubber or steel bracelet with diver’s extension. Both versions feature the distinct locking crown guard unique to the Frogman which make this model really stand out from comparable dive watches. 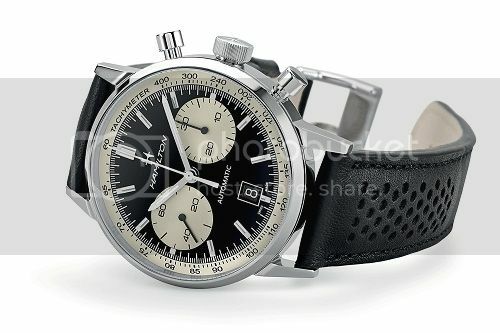 One of the hottest releases from Basel this year is the Intra-Matic 68, a vintage inspired reverse panda automatic chronograph from Hamilton. 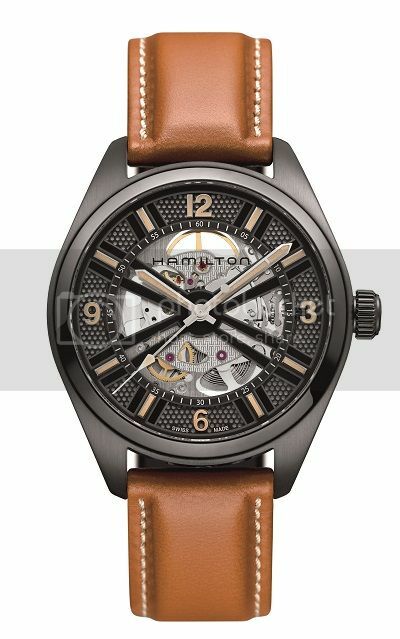 This is directly inspired from the early chronographs from Hamilton in 1968. The modern execution is an updated 42mm case size housing a H-31 movement providing a 60 hour power reserve. The Intra-Matic 68 is limited to just 1968 units worldwide and they will go quick! Canada will only receive about 20 units and we already have deposits placed. Please pm or email me at justin@gembycarati.com for pre-orders!